On the way there I decided to take US-287 that runs southwest from Denver. I was looking to verify / refute my reputation of the road. My memory is that it is not a fun road as it's two-lane with a fair bit of traffic with some steep hills tossed in. On this mid-day Saturday traffic was light enough to not be much of an issue but I still don't care for it. Perhaps two shining spots along the way are Tiny Town and Coney Island. Tiny Town is a small scale 'town' / park setting that has some small scale trains that people can ride. 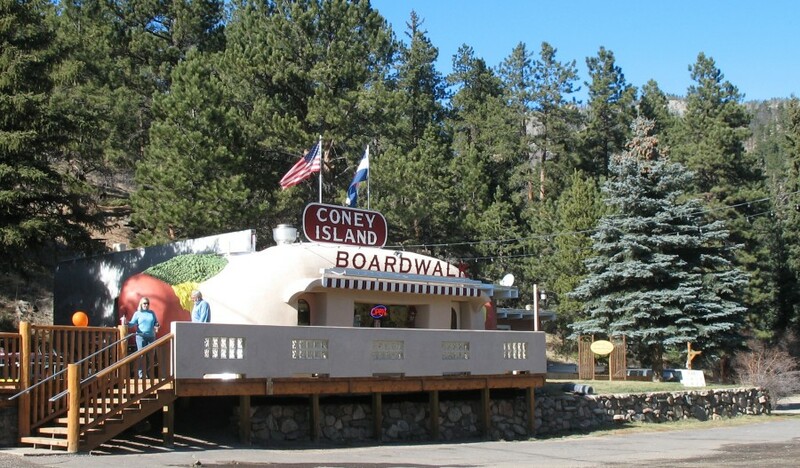 Coney Island - food in a hot dog shaped diner! I passed other luch spots in hopes I'd be able to see this place from the road (the yellow street sign saying "Coney Island" was a nice touch). South of Coney Island on US-285. 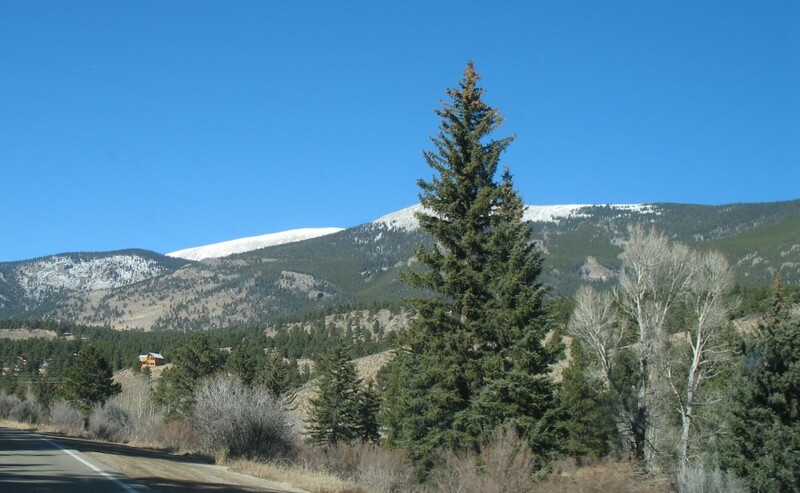 Kenosha Pass (10,001 feet) coming up. A mile after Kenosha Pass the road takes a right and the narrow, constrictive valley we've been riding in since we left Denver opens up into the wide South Park valley basin. 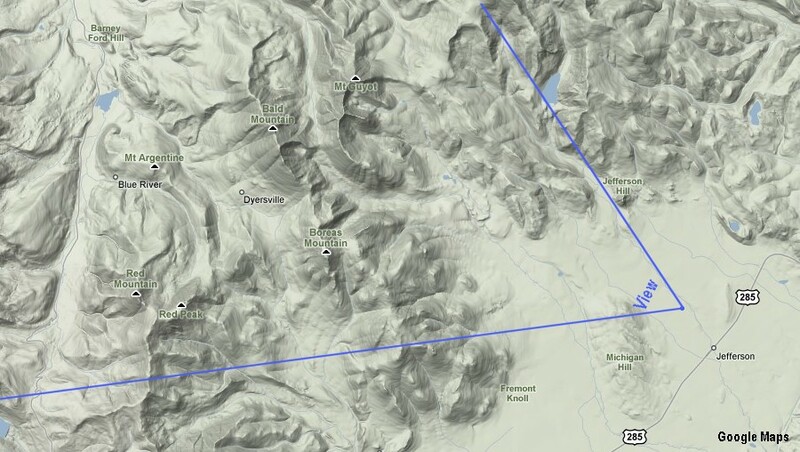 Not positive of the peaks, but from the topo map I'm looking at I think the tallest peak on the left is Boreas Mountain (13081 feet, 3987 meters), the flatter, slightly shorter to the right of it is Bald Mountain (13,638 feet, 4,157 meters) [farther away so it looks shorter], to the far right Mt. 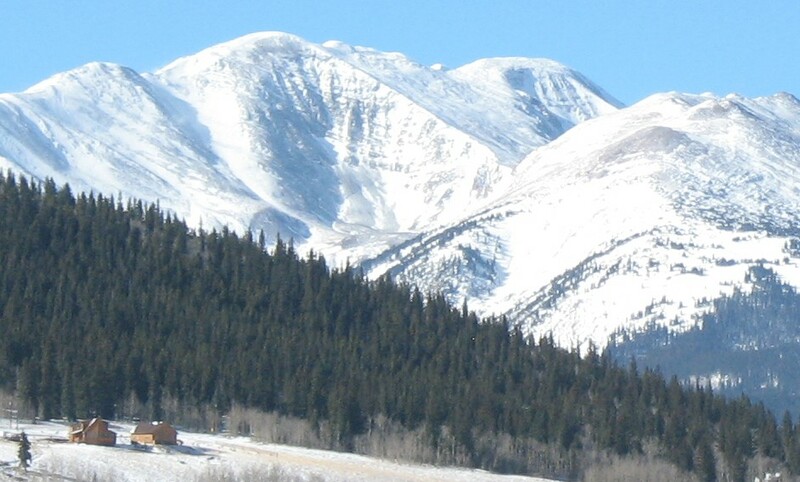 Guyot (13,297 feet, 4,053 meters). 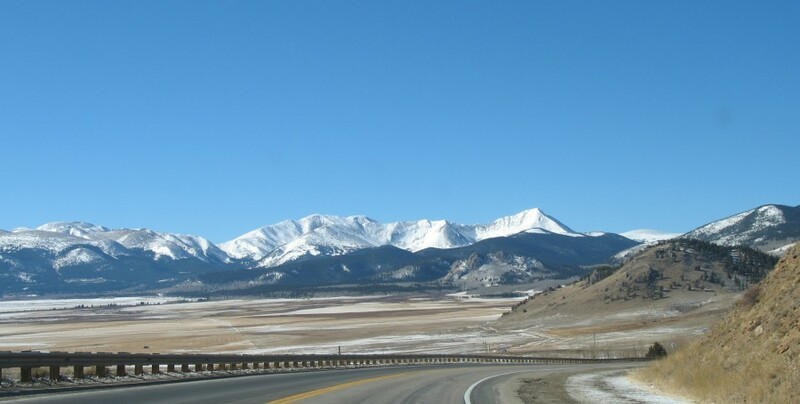 Somewhat on the other side of these mountains is the town of Breckenridge CO.
About 45 minutes south from the above photos we make a stop at Wilkerson Pass. Here's a topographic map of the area. 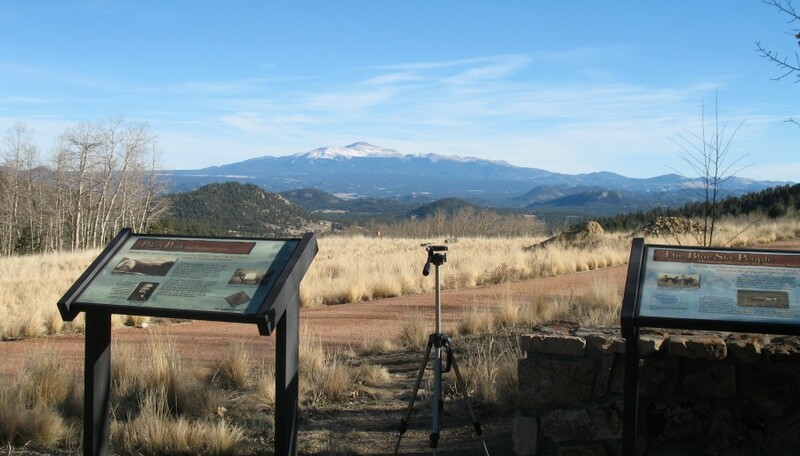 "A" is Wilkerson Pass, "B" is George & Barbara's home, and "C" is Pikes Peak. 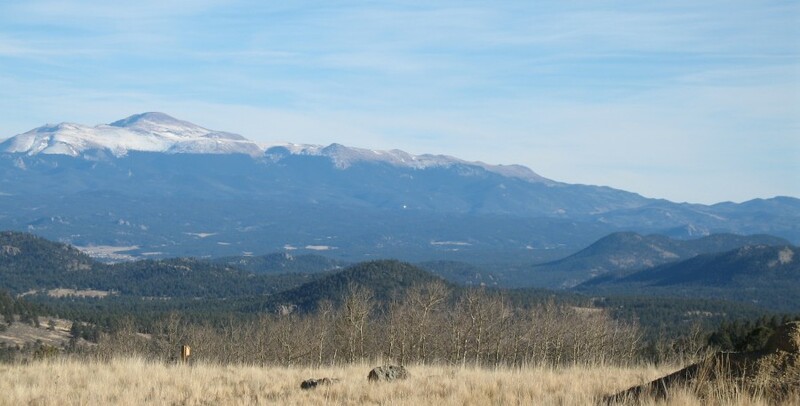 As they are only 5.5 miles west (as a crow flies), I like to say they live on the western slope of Pikes Peak. A while back George commented that from his deck he could see car headlights at Wilkerson Pass. 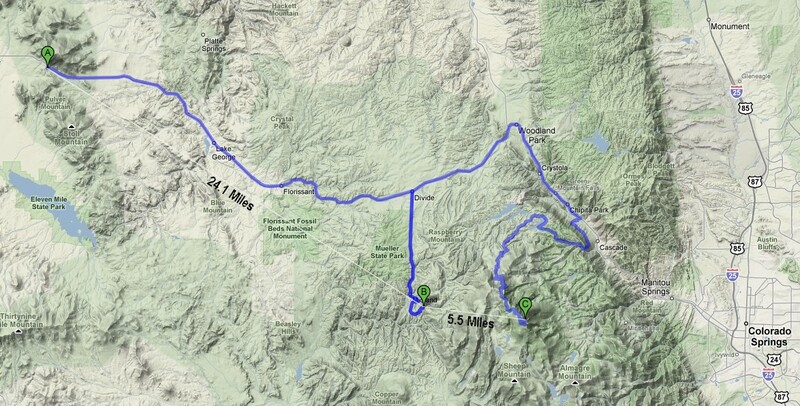 The pass is 24 miles away, across a couple valleys with a low row of hills between. 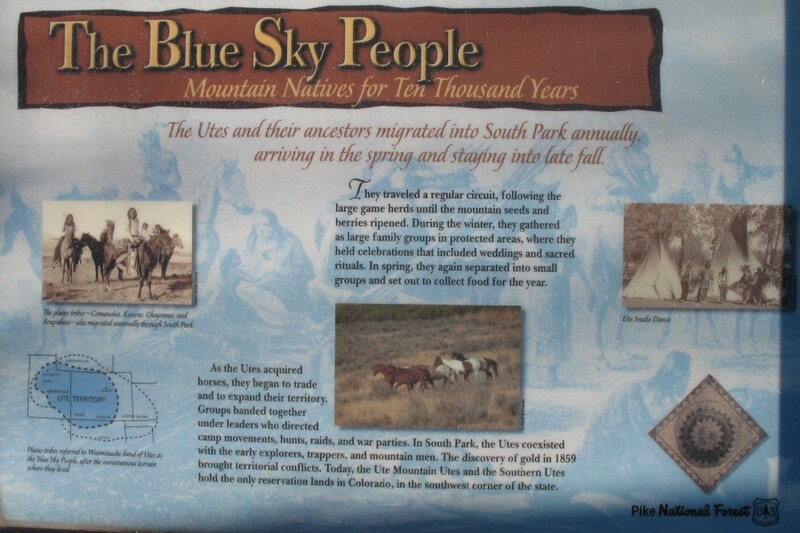 As I would be traveling to their home via Wilkerson Pass I called them and asked if they would be interested in an experiment - take a mirror and shine the sun towards the pass. Would I be able to see it? YES!! He started with an 8" diameter handheld mirror (it was visible) and then moved to a 2' x 4' door mirror (quite visible). This would give us an idea where they were in the sea of dark pine trees. 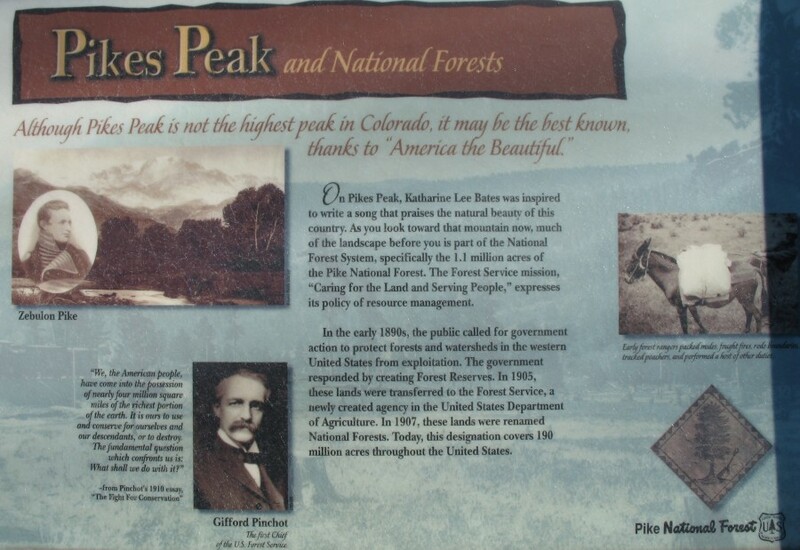 The high peak is Pikes Peak (14,117 feet, 4,303 meters). See George & Barbara? They're looking over at us. Ah, there they are. The white dot close to the center of the picture. Compare the two - the bottom has the "mirror shine" and the top does not. I am at the Wilkerson Pass rest stop. 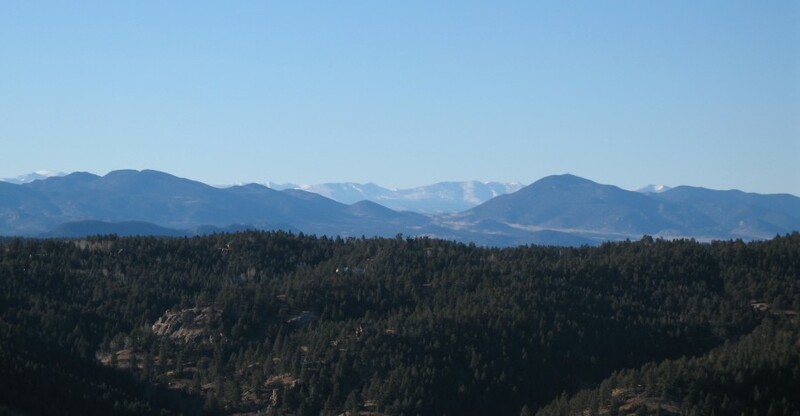 Now, from their deck looking across towards Wilkerson Pass, 24.1 miles away. 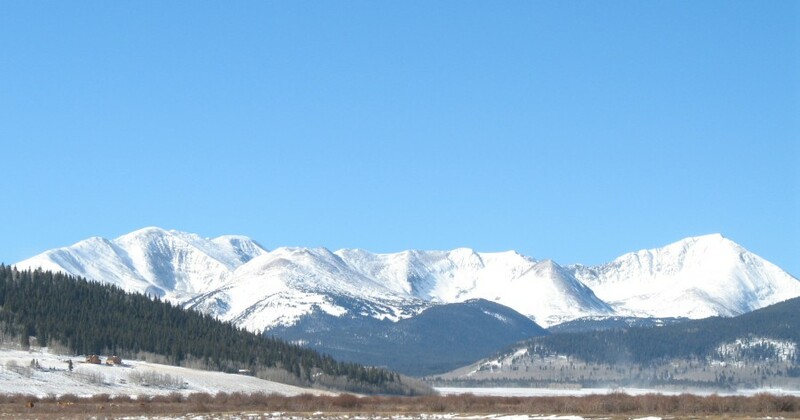 The tall peak to the right of the pass contains several radio towers. One of those towers is for wireless Internet access that they use. 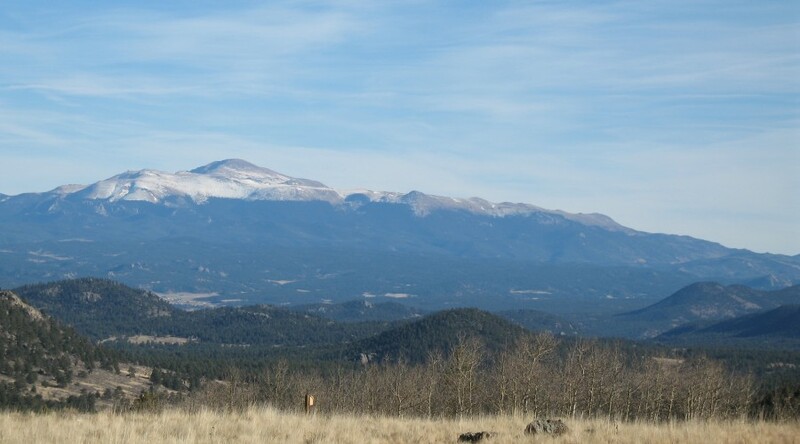 Wilkerson Pass - close up. The white dot is about where I was. Humpph... I'm a bit miffed at myself. I thought I had a panorama photo from their deck from a prior visit. Now, I can't find it. The view they have is WONDERFUL. Two photos up is perhaps 25% of the overall view.